Every time a new superintendent is hired to lead the Edgewood School District, Mary Lee Reyna makes a lunch date. The retired Edgewood teacher and longtime resident is a player in this tightknit community, and the gesture is a chance to get acquainted. Since 1992, Reyna has laid down the law for four superintendents — Dolores Muñoz (lasted 8 years), Noe Sauceda (lasted 9 months), Luis Gonzalez (gone after 21⁄2 years) and Richard Bocanegra, who took over in 2003. 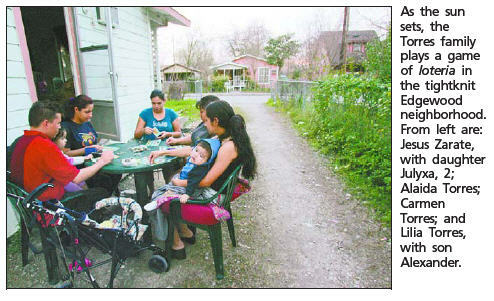 Edgewood, Reyna says, is like an extended familia. Its 16 square miles contain few secrets, and residents treat outsiders with a skeptical eye. That fighting spirit has made Edgewood ground zero for the ongoing debate over how to provide high-quality public education to Texas students, rich and poor. The fight began in 1968, when 400 students at Edgewood High School marched to the administration office demanding better supplies and qualified teachers. That year, Edgewood parents filed Rodriguez vs. San Antonio (School District) in federal court, setting off decades of legal battles. They turned to the courts again in 1984, scoring a victory when a Texas state judge ruled the school finance system unconstitutional. The remedy legislators crafted — dubbed Robin Hood — requires 134 property-rich school districts, including Alamo Heights, to share their wealth with the rest of the state’s districts, Edgewood among them. The district’s per-pupil spending last year was $7,891, compared with the state average of $9,948. There’s little doubt that Robin Hood has helped Edgewood. The district has seen a $700 million infusion of state money in the past decade, along with a healthy dose of federal money. Total revenue per student was $8,729 last year, compared with $4,315 in 1994, according to the Texas Education Agency. The money brought progress in the 1990s; more certified teachers appeared in classrooms, new programs were implemented and schools upgraded. But Edgewood continues to suffer from a divided board, near-constant changes in leadership, parent distrust and a host of problems common to historically poor schools. As the overall population of the district has aged and dwindled, enrollment also has declined, setting off a round of controversial school closings and consolidations. Student performance, though improving, continues to lag. Legislators are working to meet a court-mandated Oct. 1 deadline to once again design a better way to fund the state’s poorest schools. 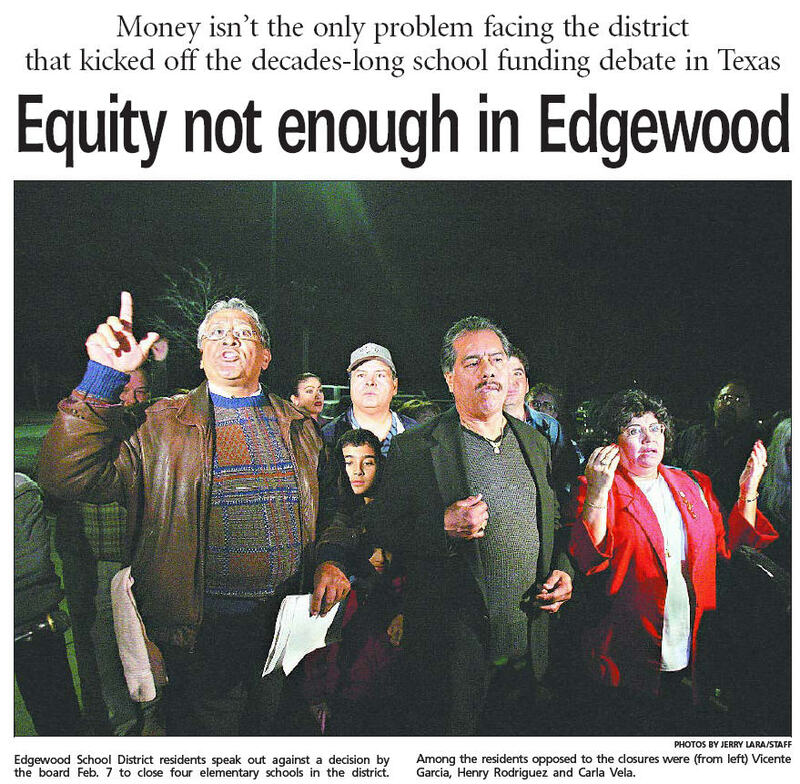 As they debate, the San Antonio Express-News visits the district where it all began and asks: Can equity solve Edgewood’s problems? Bad news, no stranger to the Edgewood schools, remains in abundance. Last year, the district’s two high schools — Memorial and Kennedy — landed on the list of schools labeled “needs improvement,” along with 15 other Bexar County schools in seven districts. The federal government applies that label to schools that fail to make sufficient progress for two consecutive years as required by President Bush’s public school overhaul. Over the past decade, Edgewood’s enrollment dipped from 14,547 to 12,617, a 13 percent decline that has translated into a loss of millions in state funding. At the same time, school choice proponents have swooped in with voucher programs such as the CEO Foundation’s Horizon program, created in 1998. The program targets the Edgewood district and so far has given 5,414 students up to $4,700 each to attend a private school at one time or another. Last year, 94 percent of Edgewood students qualified for free or reduced lunch. The district’s enrollment is 97 percent Hispanic. “Many of my students don’t have the luxury of being fulltime students,” said Daniel Piña, who teaches social studies and economics at his alma mater, Kennedy High School. Linda Bononcini, assistant superintendent of curriculum and instruction, echoes Piña’s lament. that it had won its appeal of the “needs improvement” designation. The victory removes Kennedy and Memorial from the list and from the risk of sanctions under the No Child Left Behind federal school reform law. Thirteen of the other 15 Bexar County districts on the list also won their appeals. Ten years ago, 36 percent of Edgewood’s 10th-graders could pass the math portion of the Texas Assessment of Academic Skills, while 57 percent of third graders passed the reading and math portion of the test, according to the Texas Education Agency. Last year, 41 percent of 10th graders passed the math portion of the Texas Assessment of Knowledge and Skills, the more rigorous required exam adopted two years ago. Eighty-one percent of third-graders passed both the math and reading portions of the test. And after years of being rated “acceptable” — essentially, average — under the state’s system, Edgewood won “recognized” status in 1999, second only to “exemplary” in the rankings. Muñoz, the superintendent during that time, didn’t stay around to enjoy her success. Bruised by fights with a newly elected school board majority, she left in 1999, waving goodbye to the two years left on her contract. She took a job as superintendent of Point Isabel schools in Port Isabel, and now is retired. “Muñoz had a vision and a plan,” said Lucy Hall, a retired teacher and administrator. Tina Morales, a former board member, said Muñoz’s only weakness was that she was fair. Edgewood parents and educators say they have been betrayed too many times to trust outsiders. But Edgewood has betrayed itself, too. Turned inward, the district’s fighting spirit has, at times, become corrosive. In 2001, Sauceda shocked the community when he left after nine months. Luis Gonzalez’s leadership style clashed with the board’s majority and the union representing school workers such as janitors. He left in 2003 after 21/2 years. “People come here with the attitude that they know what’s best for us,” said Demetrio Rodriguez, for whom the 1968 school equity lawsuit is named. The near-constant leadership changes have hampered progress, even those who believe strongly in Edgewood’s potential say. After Gonzalez’s departure, trustees decided it was time for stability. A divided board selected Bocanegra — its first homegrown superintendent — to lead the district 38 years after he graduated from Edgewood High School. “We needed someone who knew the district, but we also needed someone to unite the district,” board President Ramiro Nava said. That decision left some school board members bitter. That year, hoping to mend their turbulent relationships, trustees traveled 45 miles to the Flying L Guest Ranch, a Hill Country resort, where they spent three days with a facilitator named Mary Rauch. The final bill was $8,449 — $2,699 for the meals, entertainment and lodging package in addition to the fee for a facilitator, according to a bill provided by the district. The district paid Rauch, of Mary Rauch Communications, $5,750. Rauch, whose Web page describes her as a professional communicator who has taught communication skills, writing and public speaking for 22 years, was hired two months later to conduct a team-building session for the superintendent’s cabinet. The final tab for that session was $2,500. Trustee Jesse Alcalá said board members, who were known for fistfights behind closed doors, enjoyed a short honeymoon period after the retreat. “It worked out for a while,” Alcalá said. But critics question why the district spent thousands on a resort and consultant. Fifth-grade teacher Debbi Verstuyft uses her creativity to give hands-on science lessons at Hoelscher Elementary School. Like most older schools, her elementary doesn’t have a science lab and her classroom doesn’t have a sink. Built in 1961, Hoelscher can’t meet the demands of 473 students, not to mention the added pressure that a new state-mandated science test for fifth-graders has put on teachers and kids. Some classrooms are too warm, others too cold. Pre-kindergarten and kindergarten students — about 110 of them — share a small bathroom down the hall. Computers sit crammed next to each other, and wire dangles from the desks in the school’s computer laboratory. When the room gets too warm, the computers crash, said Pam Reece, Hoelscher’s principal. Next year, Hoelscher will close and most students will transfer to newly renovated Roosevelt Elementary, scheduled to open in the fall with Reece as principal. It’s a sign of Edgewood’s family spirit that the thought of losing the aging school fills many with sadness. In this district, it is not uncommon for three or four generations to attend the same schools. “It’s pretty sad because I like this school,” said James Ventura, a fifth-grader and third generation student. But dwindling enrollment and a $3.6 million budget shortfall have forced tough decisions. In December, officials announced they would shutter Hoelscher, H.K. Williams, Emma Frey and Burleson elementary schools, sparking outrage and a petition drive among parents asking the board to reconsider. Anger was exacerbated by a $56.6 million bond package trustees placed before voters last June. The money was going to pay to tear down and rebuild two aging schools and make other improvements. As they campaigned for the bond, board members said nothing about a plan to shutter schools. Edgewood voters approved the bond only to learn later that four schools would close for good, intensifying the feeling of betrayal. Those who support the school consolidations have pleaded with parents to face facts: Edgewood is shrinking. Whatever their concerns, parents are slowly coping with the changes, said Frances Madrigal, a parent facilitator at Hoelscher. Edgewood’s many boosters, among them ninth-graders Nicolette Muñiz and Sarah Ríos, like to show off the Edgewood Academy of Communications and Fine Arts. “We are so blessed to have this equipment on this side of town,” Muñiz said as she escorted a visitor through television and radio studios. Opened in 1998 and intended to one day be a magnet, the school boasts a state-of-the-art building and courses in dance, sculpture and music for the seventh- through 12th-graders who attend. Last year, the academy received three gold performance awards from the TEA for attendance, advanced academic courses and writing. District officials converted Edgewood High School, which has suffered from declining enrollment, into the academy. The decision to close the old high school angered residents who felt loyal to it. The $13.6 million face-lift included an auditorium that was closed several years ago because of problems with leaks and mold. Newly elected board members also rejected a plan that had been carefully crafted by a committee to open the academy to district high school students first and then, after two years, to students throughout San Antonio. Today, the school, which has a 700-student capacity, remains just over half-full and still is open only to students in Edgewood. “We had a beautiful plan,” former board member Morales said, but it never was carried out. The board painted the academy red and white — Edgewood High’s colors — and restored the old high school’s emblem. When the academy opened, no dedication ceremony took place. Edgewood educators say equity funding has made a clear and positive impact on their district. They point to last year’s improved TAKS scores and an increased number of elementary schools winning the state’s exemplary and recognized ratings in recent years as proof. But the challenges never seem to stop coming. Jimmy Vasquez, superintendent when the equity lawsuit started, has seen Edgewood through its journey from poster child for school equity to a shrinking urban district fighting demons both internal and external. A staunch advocate for Edgewood’s students, Vasquez taught math and government and was a vice principal and principal at Kennedy. He rose through the administration ranks and was named superintendent in 1978. He left the district in 1991 and is now executive director of the Region 19 Education Service Center in El Paso. “Every year it was a battle to survive,” he says. “Edgewood is not a community that ignores education, but they have to overcome decades of racism and neglect,” Vasquez says. “How can you undo 100 years of neglect and underfunding? In Bexar, the percentage almost doubled in three years. As a freshman at Jay High School, Jesus Martinez became the center of his social circle every time he skipped classes to take his friends for a swim at his mother’s pool. His truancy habits didn’t change much the following year after he transferred to Warren. His grades plummeted, Martinez said, and he couldn’t recover academically even after his mother moved him later that year to Southwest Preparatory School. Martinez is one of 19 students enrolled in the General Educational Development preparatory classes at the Northside School District Learning Center. Like many teens there, he was court-ordered to attend the program. Whether the cause is pregnancy, truancy or the social pressures of high school and high-stakes testing, the number of school-age teens settling for a GED certificate has been on the rise. But the outcomes for GED earning teens are not equal to those of high school graduates. And research shows a GED certificate has less earning power than a high school diploma and that people with GED certificates tend to fare at the same level as high school dropouts. 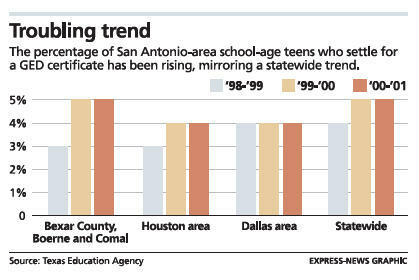 In Bexar County, the number of high school-age teens who received GED certificates has almost doubled, from 3 percent in 1998 to 5 percent in 2001, according to a computer analysis of Texas Education Agency data conducted by the San Antonio Express-News. Statewide, high schools had a similar trend, with 5,379 students receiving the GED certificate in 1998 and 9,053 in 2001, the analysis showed. “We’ve seen more and more 16-year-olds dropping out,” said Lydia Martinez, director of Northside School District’s adult and community education. In Texas, the number of teens taking the test, but not necessarily receiving a GED certificate, has increased by 18 percent, jumping from 27,929 in 1999 to 32,821 in 2003, TEA statistics show. High school test-takers are mostly Hispanic and five out of nine are males in a state that ranks 37th in graduation rate nationally. And though Texas has not counted GED students as dropouts in the past, the No Child Left Behind Act will require it beginning in 2005. Every year, a high percentage of students — disproportionately poor and minority — disappears from the education pipeline, according to the Civil Rights Project at Harvard University. At the national level, only 68 percent of all students who enter the ninth grade will graduate on time. “I think the GED has its special purpose, but the public needs to know what the role is — a second chance for older people who didn’t finish high school,” said María “Cuca” Robledo Montecel, executive director for the San Antonio based Intercultural Development Research Association. Developed in 1942 to provide returning World War II veterans with the opportunity to earn a high school credential, the GED test measures academic skills and knowledge in the five areas: math, social studies, science, reading and writing. A student must pass all areas to get the certificate. Nationwide, more than 160,000 students between 16 and 18 have received GED certificates each year from 1999 through 2002, which is up from around 81,000 in 1989, according to statistics from the General Educational Development Testing Center. Experts said the growing numbers of young GED certificate recipients point to underlying problems in the system, which tends to ignore students who are not doing well academically and are poor candidates to pass the Texas Assessment of Knowledge and Skills. “Our research shows that there’s a link between testing and dropouts. The kids who don’t score high on the test tend to drop out of school,” Montecel said. But Jay P. Greene, a senior fellow with the Manhattan Institute for Policy Research, said his research found no relationship between testing and dropout rates. The reasons that prompt students to leave high school are not always academic. Some are single parents who need to work, while others dropped out after years of social struggle. And some would argue the lack of vocational programs has left many students without many choices. Carmen Ugarte spent more than two years trying to fit into the social circles at Jay and, later, Warren high schools. Ugarte, who describes herself as a good student, said her mother transferred her to a private school, but that didn’t prove to be any better. Now, the teen attends the Northside district’s GED program and hopes to enroll in college after she passes the test. Experts say GED recipients are less likely to attend college, and 95 percent of GED recipients who enter college fail to finish, as opposed to 25 percent of high school graduates, according to “The GED Myth” by Greene. William Bormann dropped out of school in 2000, but he took the GED test, attends community college and is 18 credits away from attending nursing school. Bormann, 19 and a part-time instructional aide with the adult education program, said he wants to motivate students. Bormann’s high school career ended abruptly after he was injured while playing football during his freshman year at Marshall High School. His social life suffered and so did his grades. Bormann was homeschooled for two years and he tried to return to another high school, but school officials wouldn’t accept his credits. He got his GED certificate in 2002 and enrolled at Northwest Vista College. Northside’s Martinez, a former middle school principal, said the lack of vocational programs, often victim to budget cuts, also is affecting some students, who have no reason to stay in school. Federal funding for vocational programs has been cut in schools around the nation. And in Texas the Bush administration has proposed $80 million in funding for the 2005 academic year, a 23 percent drop from last year, when the state received $104 million. Participating in a GED program is no guarantee of receiving the certificate. Duncan Chaplain, a researcher with the Urban Institute, said many kids pushed into the GED program are not ready. “They usually think they can take the GED test fast and obtain the certificate,” Chaplain said. At Northside Learning Center, students work individually as they attend the preparatory courses. Classes are held for three hours, focusing on different subjects each day, teacher Tang Carroll said. Most students, Carroll said, need guidance and are not disciplined enough, while others need motivation to stay focused. But teachers treat them as adults — if they miss five classes without the proper excuse, they are dropped from the program. “We let them work individually, but it is a challenge to work with teens at different levels,” Carroll said. During a recent class, Jesus Martinez sat surrounded by his classmates, ages 16, 17 and 18, as the group discussed a science practice test. A week later, three new students — a 16-year-old and two 17-year-olds — joined the class. Under state law, 16-year-old students can attend the program only under court order. Seventeen-year-olds who drop out need parental consent and records showing withdrawal from school. As do many of his classmates, Martinez attends GED classes in the morning and works during the afternoon. 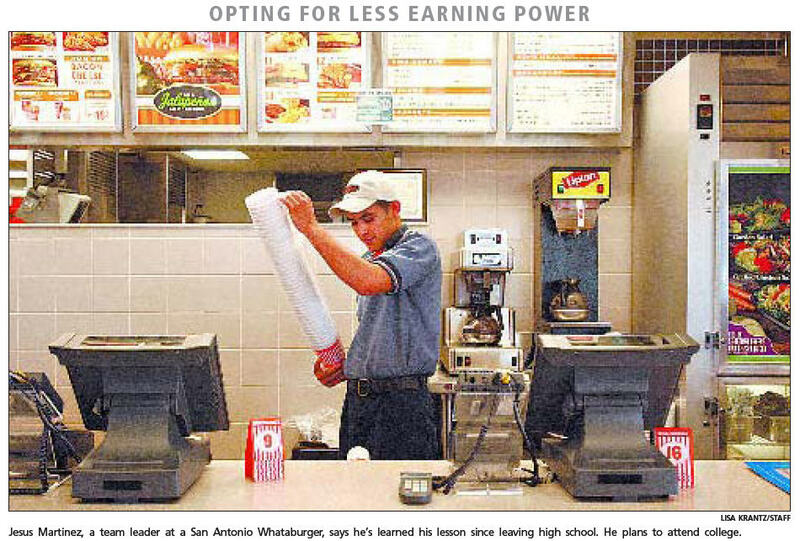 He’s a team leader at Whataburger and plans to attend college to become a certified auto technician. The teen reminisced about the past, expressing regret at times. He misses school, friends and playing football, but he said he’s learned his lesson. 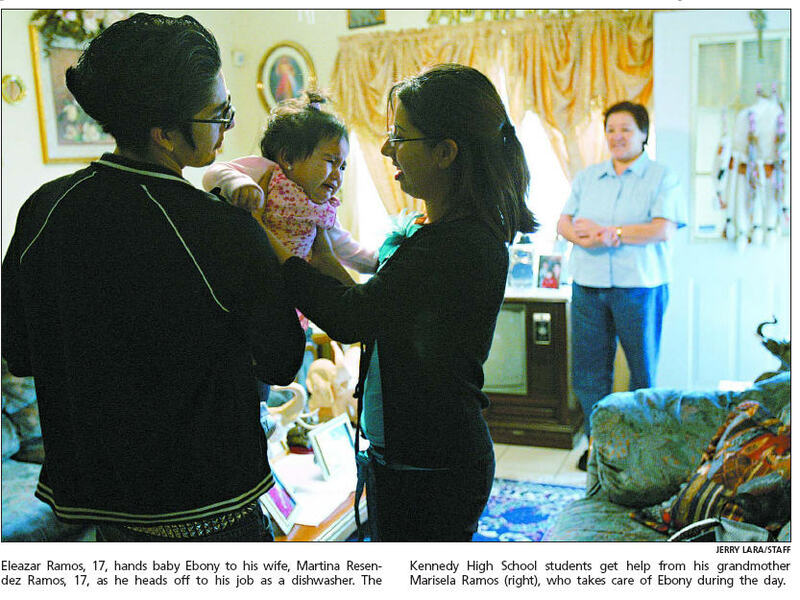 And Martinez is determined to achieve his goals for himself and for his single mother, and also to inspire his 8-yearold brother to stay in school. The San Antonio Express-News published this article on November 1, 2004. Mc Nelly Torres was an education reporter for the Express-News from 2002- 2005. School district’s board outspent Alamo Heights’ more than 2-to-1. Last year, the Harlandale School District’s board reduced school outings to one field trip per grade in an effort to trim the budget. The move was expected to save $118,400 in a district that had experienced three years of belt-tightening and faced a projected $5.3 million budget deficit by June 2003. But as trustees and top administrators considered a list of proposed cuts, the board did not slash its own travel, although the items on the list to eliminate included the computer and online programs known as FastForward and OASIS. Since 1999, trustees and top administrators have spent almost $72,800 on convention trips and car rentals, the San Antonio Express-News has found. A review of hundreds of travel records and receipts showed trustees alone spent $38,247 from 1999 to 2004, despite facing budget shortfalls. By comparison, the board for the Alamo Heights School District, the wealthiest district in Bexar County, spent $17,537 in the same period. Some former and current trustees disagree with spending district money this way. Juan Mancha, a Harlandale resident, said top administrators and the board should make cuts starting from the top. A field trip to a local museum for 22 students would cost the district $145 for the bus, mileage and lunch. “I think it’s outrageous and very wasteful that they are cutting programs but kept traveling,” former trustee Leo Rodriguez said. The district has paid for trips to annual board-related conventions. But there have been trips of questionable value to the job of a board member, such as ones to conventions geared toward professionals in a specific field. In 1998 and 1999, longtime trustee Gracie Acuña attended the International Dyslexia Association conference, the first year in San Francisco, the second in Chicago, at a combined cost of $3,354. The association’s Web site says the conference sessions are geared toward educators, administrators, educational diagnosticians, therapists, parents, and speech and language pathologists. In fall 2001, when Collier Elementary School received the Blue Ribbon award from the U.S. Department of Education, taxpayers paid $1,285 for Acuña to go to Washington. The following year, trustee Myra García went to the nation’s capital to attend the two-day event in which Kingsborough Middle School was honored with a Blue Ribbon award. García, then board vice president, traveled with her husband and stayed in Washington for four days, spending $1,414 of the district’s money for her expenses. Just three months after García’s trip, Superintendent Guillermo Zavala wrote a Christmas letter to the staff, highlighting the school district’s uncertain financial future. At the time, Zavala predicted a $5 million budget shortfall. The district’s financial problems can be traced to a drop in student enrollment. The decline has translated to the loss of millions of dollars in federal and state funding. While efforts to streamline spending have touched programs throughout the district, such as the community action group known as SUAVE, trustees and some top administrators continued to travel at the district’s expense. 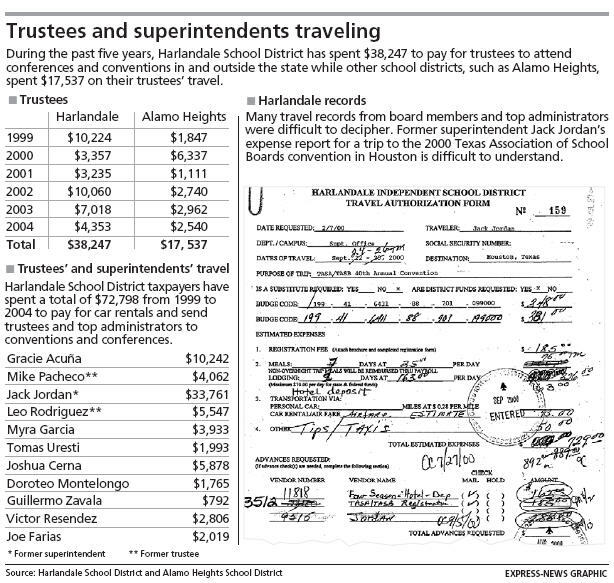 Although Zavala’s travel has been less than any board member — $792 to attend the Texas Association of School Boards conference — in his two-year tenure, that has not always been true of the district’s superintendent. In January 2002 former Superintendent Jack Jordan announced he would retire the following April. But even after that, Jordan made at least five trips to conventions at the district’s expense, totaling $5,247. His trips to numerous conventions, in San Francisco; New Orleans; New York; Atlanta; Orlando, Fla.; Washington; and San Diego, Calif., amounted to more than half the travel expenses in the three school years from 1999-2002 and cost $33,761. Harlandale critics said when trustees bring their spouses to the conventions, it gives the impression trips are for pleasure rather than professional development. Jordan, former trustee Mike Pacheco and trustees Acuña, García, Tomas Uresti and Joshua Cerna all have taken their spouses to conventions. “Anytime you paid an additional person, whether it is your wife or your child, it’s going to lead you into trouble,” Rodriguez said. The school district doesn’t pay for spouses’ travel, but it has led to additional expenses for the district. At the annual Texas Association of School Boards convention in Dallas last year, trustees Uresti and Cerna rented separate vehicles to drive to the convention with their wives, while trustees Joe Farias and Ted Montelongo traveled in one car. No cars were necessary once they reached Dallas because the convention center provided transportation to the hotels. Uresti said he rented a vehicle because his truck was too old to make the trip. On two other occasions, Cerna’s wife, Cristina Puente Cerna, a math teacher at Harlandale High School, traveled with him to conventions, one in San Francisco last year and another in Orlando in March. At the time, her students were preparing to take the state test. And for the Orlando conference, Cerna again rented a vehicle, a sport utility vehicle that cost the district $241 for five days. The district also reimbursed Cerna, who put 401 miles on the SUV, $70 for gas and parking. Trustee Victor Resendez, who also attended the convention, used the shuttle. Cerna went to the two conferences after trustees Farias and Uresti urged board members during a meeting not to travel outside the state. The month after the Orlando trip, when trustees considered adopting a new filmmaking program for students, board members expressed concerns about the costs. During the Orlando conference, Cerna reported he was at a workshop titled “Data-Driven Decisions for School Finance Elections?Yes!” from 2 to 3:15 p.m. March 29, but restaurant receipts show a different timeline. Records show Cerna and three other people were starting to order food at a seafood restaurant at 2:30 p.m. The last entry in the order was recorded at 3 p.m. before they got the $67.42 bill. Upon his return, Cerna submitted receipts for meals. Records show the district gave him $47 per diem for six days instead of the actual five. There is no indication the extra day’s per diem was returned to the district. Many of the travel records from board members were difficult to decipher. They had numerous scribbles, and numbers were crossed out and written over two and three times, all showing different figures. In recent weeks, Cerna has responded to questions about travel expenses by writing checks to the district, including a $205.02 check to reimburse the district for one day of hotel and car rentals for the trip to Orlando. And after the newspaper’s further inquiries into the trustee’s travel expenses, Cerna wrote another check for $111.05 to reimburse the district for last year’s trip to San Francisco. Cerna refused to comment for this report when he was approached before a recent board meeting. Acuña recently said she had no comment, shutting her front door behind her, and García hung up multiple times when a reporter called her. Jordan also refused to comment. Trustees recently approved the filmmaking program for Harlandale High School. Meanwhile, district officials are expecting a $2.5 million deficit in the fund balance by the end of 2005. 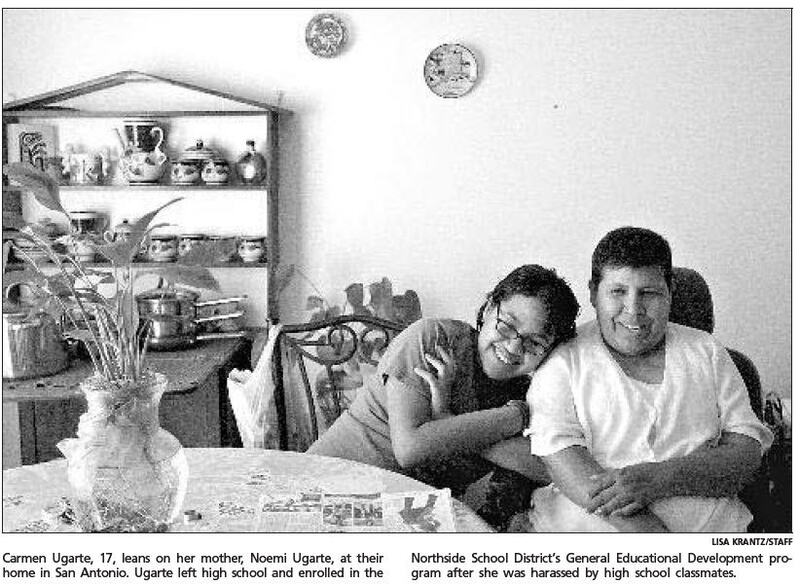 The San Antonio Express-News published this story on August 3, 2004. Mc Nelly Torres was an education reporter for the Express-News from 2002 until 2005.